Sandy Conn Arnold had an epiphany earlier this year about how to help bring healing to the country, starting in Lake County, by way of an interfaith organization. It came after she witnessed prejudice against Muslims after the Unity Church of Leesburg — the church she belongs to — sold their building to a local mosque, The Islamic Center of Lake County. Then came the Pulse nightclub shooting in Orlando. 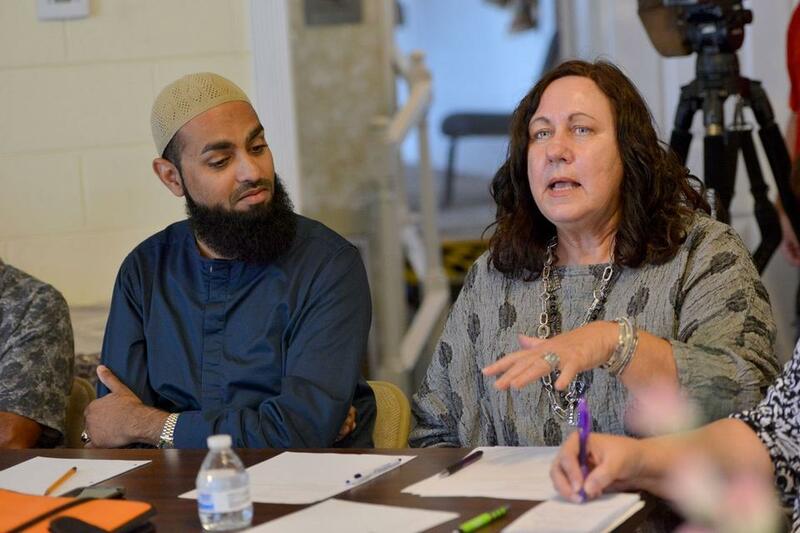 After that, Arnold and about 25 religious leaders from around Lake County came together to create Interfaith Lake County, a group designed to help the community through difficult times by showing how all religions can work together. Since its first meeting on June 27, the group has hit the ground running — and Arnold said it is just beginning. At their initial meeting, leaders identified three areas to work on — educating the community on how all religions can work together, being a resource in times of crisis and staying visible in the community as a show of unity and strength. At that meeting on June 27, the group also created an organizing committee to determine projects that fulfill the goals and formulate an organizing document. At the organizing committee’s first meeting on July 18, the group developed five project ideas and an official startup document, complete with the group’s mission statement, philosophy, shared understandings and general goals. At a second meeting on August 1, the organization decided that Interfaith Lake County would stand on its own rather than merging with the Interfaith Council of Central Florida. She said the committee will meet once more and set a time for the entire interfaith group to come together. At that time, project ideas will be presented. Arnold said she is looking forward to what Interfaith Lake County will accomplish and is excited at what has already been done. “In a short period, we’ve developed a really strong core group that show up to every event that has come up since we formed,” she said. Interfaith members have attended the American Muslims for Peace march in Orlando, an Interfaith Peace Partners “Prayers for Peace” service in Oxford and a Black Lives Matter peaceful protest in Tavares. At the Tavares event, Imam Azhar Subedar, the spiritual representative for the Leesburg Mosque and founder of Purposeful Life, a not-for-profit, Tampa-based organization, spoke about peace and unity. Subedar said he hopes to see Interfaith Lake County give a human face to all humans regardless of who they are and what they believe in. “Our strength and success is within our diversity and the acceptance of one another,” Subedar said. Arnold said the next order of business for Interfaith Lake County will be replicating a Prayers for Peace service. She said the ones held in Sumter County have attracted hundreds and are growing. “We think we can do that in Leesburg too so we are looking at big enough church venues,” Arnold said. Other projects on the horizon for Interfaith Lake County include publicly denouncing inflammatory, divisive and untrue rhetoric about any religion, creating a youth program for high school students and partnering with American Muslims for Peace to create a “Not in My Name” rally in Lake County to spread the word that Islam is not a terrorist religion. In light of recent terrorist attacks throughout the world, Habib Shaikh, a board member of the Islamic Center and part of the interfaith group, said the Islam religion stands for peace and unity. He said extremists misrepresent the Muslim faith. Arnold said the group is also working on a partnership with Beacon College and Lake-Sumter State College to bring educational lectures and forums with a panel of clergy of all faiths to students. She said that may help reach younger generations, educate them about social, world and ethical issues and about what roles they can play. This entry was posted in All Lectures, Highlights, Interfaith. Bookmark the permalink.